Here at Shutterly Fabulous in Brighton and Hove, we pride ourselves on being able to offer our customers shutter designs to suit their lifestyles and to keep in line with any of the original décor they already have. This Reading based customer has sent in a picture of their oak stained conservatory window shutters, which ties in beautifully with the construction of the conservatory. 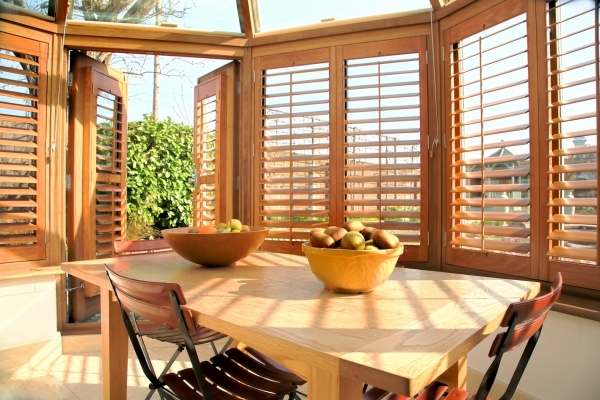 Shutters can have a dramatically different visual appearance depending on which colour you choose. More than any other design choice you make for your plantation shutters, colour is without doubt the most personal of choices you can make. This customer chose an Oak wood stain for their conservatory window shutters as it fits with the constructional wood of the conservatory, however another influential factor is the type of furniture you have in the room. If the room has a wood stained floor and a few items of wood stained furniture, having walnut or honey oak stained shutters could look too heavy – an over abundance of wood stains in the room. In such instances, painted shutters can look more subtle and help for part of the overall look of the home. Wooden window shutters with a well chosen wood stain can look fantastic and really show off the beauty of the wood used as this Reading based customers conservatory shutters illustrate.